Our mason finishing grinding the mortar out of all the ground-level brickwork and they got started on the chimney today. 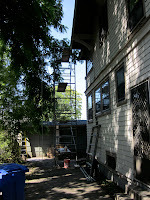 They built a scaffold up to the roof and disassembled the chimney this morning. We've decided to to go ahead and reuse the existing bricks, so Pedro cleaned them up and they're ready to get put back together tomorrow. Jeff headed up to the roof this afternoon for the photo op. He also took some nice photos of the yard. 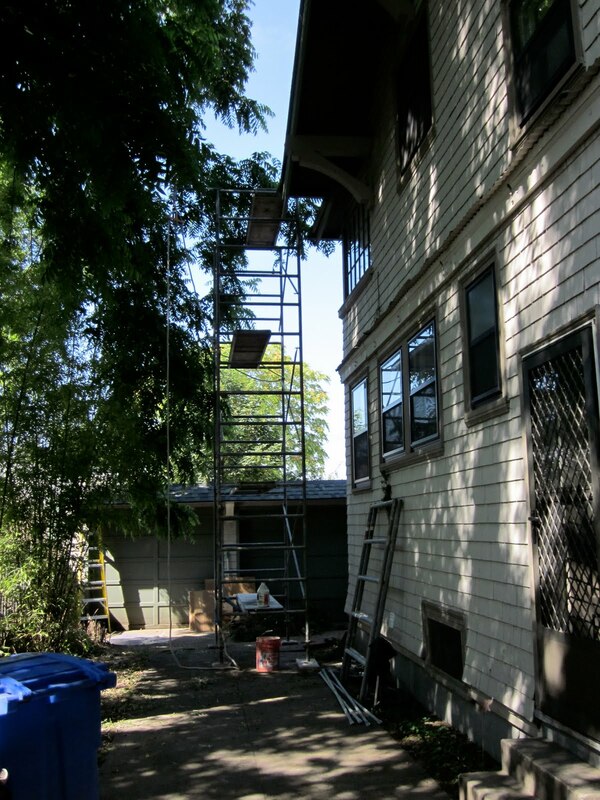 That remaining chimney will be pulled down as soon as we can redirect the HVAC exhaust pipe. But, we need a whole house plan before we do that work. On that goal, we are currently in negotiations with Green Hammer to hire them to design and do a number of the planned renovations. We still plan to do as much ourselves as possible, and we may also hire some other contractors for bit jobs. We'll see. Getting from the roof back onto the scaffolding was the scariest part.